Well all know that the term “dailies” came about as it usually took a day for the lab to develop and print the daily film footage so that the director and producers could review the footage to see if any reshoots were necessary. That often meant a costly use of a screening room, hiring the union projectionist, and if you needed some pickups, you had to reschedule cast and crew at a later date. But in the digital era, dailies are more rushes than they have ever been, with sets being able to not only review the shot in real time and then rapidly go again, but also to do on the fly color correction so that you can get a pretty good idea what the finished product would look like. That’s what Express Dailies buys you. Written by ColorFront, Express Dailies is a workflow management utility that not only offers basic color correction of files as they are shot, but also offers metadata management, audio management, playback and sync, data wrangling and more. The Express Dailies suite comes with a pair killer utilities including On-Set Live! color grading, and Copy Central™ archiving and data management capability. With On-Set Live!, offers full end-to-end production workflow with live grading via live SDI feeds from multiple cameras. 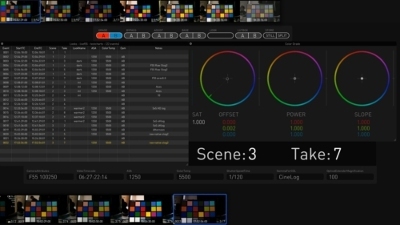 The on-set color grader creates and manages looks, previews footage and grades on a live RAW camera signal, great for use with Blackmagic Cinema Camera workflow or any other Raw based camera setup (can you say Magic Lantern?). Color grading can also be used with external 3DLUT boxes, such as Pandora Pluto , Blackmagic Design HDLink Pro and T-Cube Fig, while Camera and lens metadata, including color temperature, ISO, focus and zoom parameters, can be captured and logged or burnt-in. Copy Central manages transfer and archiving of all completed video files to a variety of networks via a CheckSum verified copying to multiple destinations, including LTO archiving. And reports can be outputted via PDF file to be emailed, keeping your project nice and green. Other highlights include 64-bit OS X support with Mac Pro tower and retina MacBook Pro workstations, support for Sony, ARRI, Canon, RED, Phantom, Go Pro , and a wide variety of DSLRs. Express Dailies can also output to a vast array of file formats including DNxHD 444 for Avid and all ProRes formats for Final Cut, uncompressed DPX, TIFF, OpenEXR, QT, and H.264 for web-based dailies and iPad. And it’s recently enjoyed a price drop to $15,000. Available now. LOS ANGELES, May 31, 2013 /PRNewswire-iReach/ — CineGear Expo — Academy and Emmy Award-winning developer Colorfront (www.colorfront.com) is now shipping Express Dailies 2013, its high-performance on-set dailies system for commercials, motion picture and high-end episodic HD television production. This latest release delivers a new set of trailblazing productivity features that meet the demand for streamlined end-to-end dailies workflow, including On-Set Live! grading, plus verified copying, faster-than-realtime encoding of multiple deliverables, plus checksum verified ingest, copying and archival via the Copy Central™ capability. On-Set Live! provides a full end-to-end production workflow with live grading that is fully compatible with dailies, and streamlines color pipelines. It can work with live SDI feeds from multiple cameras, and enables the DIT or on-set color grader to create and manage looks, preview footage and grade on a live RAW camera signal. It supports various color pipelines including the latest IIF/ACES workflow, and can be used with external 3DLUT boxes, such as Pandora Pluto , Blackmagic Design HDLink Pro and T-Cube Fig, for color space conversion, calibration and grading. Camera and lens metadata, including color temperature, ISO, focus and zoom parameters, can be captured and logged or burnt-in. Extensive camera format support: realtime support for all major cameras and formats including the latest digital cinematography cameras from Sony, ARRI, Canon, RED, Phantom, Go Pro , as well as DSLRs. Colorfront, based in Budapest, Hungary, is one of Europe’s leading DI and post production facilities. The company was founded by brothers Mark and Aron Jaszberenyi , who together played a pivotal role in the emergence of non-linear DI. The company’s R&D team earned an Academy Award for the development of Lustre, Autodesk’s DI grading system. Combining this in-depth expertise with a pedigree in the development of additional cutting-edge software, Colorfront offers today’s most advanced technologies for scanning and recording, DI grading, conforming, digital dailies, VFX, online and offline editing, cinema sound mixing, mastering and deliverables. For further information please visit www.colorfront.com.